Wearable AI Market size surpassed USD 35 billion with more than 150 million units in 2018 and will grow at a CAGR of around 30% from 2019 to 2025. The increasing disposable income of households in the emerging economies is the primary factor accelerating the adoption of smart wearables. Over the past decade, the middle class of the emerging economies has increased significantly. According to the World Bank, the size of the middle class in the Asia Pacific region increased from 525 million in 2009 to 1,700 million in 2018 and is further estimated to reach 3,228 million by 2030. This growth is credited to the development of skilled professionals, rapid industrialization, and rising employment in the service-based industries. As a result, a fundamental shift in the consumer spending patterns toward consumer electronics product has been witnessed. This is encouraging smartwatch manufacturers to capitalize on the changing lifestyle and rise in customer spending patterns in emerging nations. The rising focus of consumers on fitness & health monitoring is driving the growth of the wearable AI market. As obesity and heart-related diseases are increasing across the globe, the demand for wearable devices among consumers to monitor their fitness levels is also rising. Fitness bands and smartwatches are equipped with various sensors to monitor numerous health-related vitals, such as heartbeats and blood pressure, allowing users to monitor their health conditions daily without the intervention of any medical professionals. It also allows users to monitor their health conditions in real-time in a cost-effective manner, promoting the use of smart wearable devices among consumers across the globe. The smartwatches & fitness bands market has dominated the wearable AI market with a industry share of over 85% in 2018. Smartwatches allow users to track various activities such as heart rate, steps covered during the day, and calories burnt. Smartwatches are becoming increasingly popular among consumers, allowing consumers to make & receive calls and manage various notifications remotely. The rising adoption of smartphones coupled with fast internet connectivity is driving the growth of the smartwatches & fitness bands market. The smartwatches & fitness bands market is currently dominated by large smartphone players, such as Apple, Samsung, and Xiaomi, which are leveraging on their global distribution network to increase their presence in the market. The head mounted display segment in wearable AI market is expected to grow at a CAGR of over 38% during the forecast timeline. Head mounted displays are extensively used in the gaming industry as they offer gamers with full 360-degree vision along with immersive, high-quality, and realistic gaming experience. The technological advancements in the head mounted display landscape led to the development of high-performance controller and gaming consoles, allowing gamers to better interact with their surroundings in a gaming environment. The high cost associated with head mounted displays is the primary factor limiting the growth of the market as consumers are becoming more reluctant to purchase screenless VR devices, that require headsets to be bundled with smartphones. 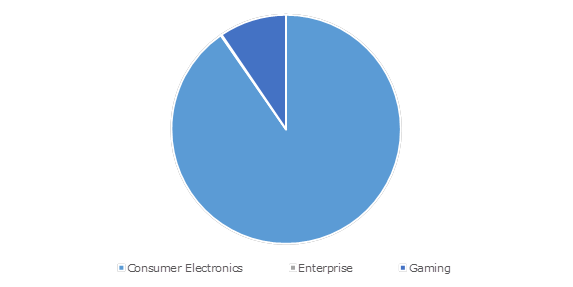 The consumer electronics segment held over 90% share in the wearable AI market due to increasing usage of smart wearable devices by consumers to improve their lifestyle. Since the emergence of smartwatches and fitness bands, the popularity of wearable technology has grown exponentially among consumers as more and more individuals are relying on smart wearables to monitor their health vitals daily. Large consumer electronics manufacturers, such as Apple, Samsung, and Huawei, are integrating advanced features into smart wearable devices to position them as standalone devices and reduce their dependence on smartphones. The enterprise application is expected to grow at a CAGR of over 50% in the wearable AI market during the projected timeframe. Smart wearable devices are used across various industrial set-ups to enable employees to communicate and collaborate effectively across remote locations. It offers users a comfortable &immersive mixed reality experience and increases the field of view by offering a three-dimensional user experience. It provides employees with real-time insights and optimizes business operations to increase effectiveness and productivity. It also improves training effectiveness by developing a highly interactive and dynamic learning environment for employees. The expensive nature of the products is limiting its adoption in industries with budgetary constraints. 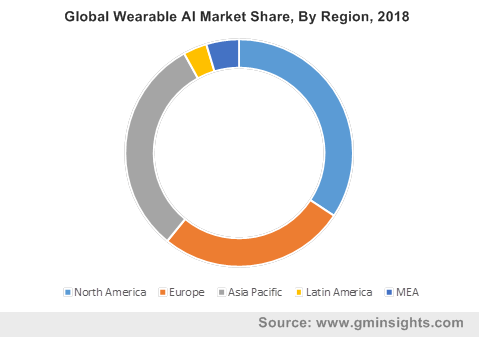 The Asia Pacific wearable AI market will grow at a CAGR of over 50% from 2019 to 2025 due to the increasing per capita income in countries including China and India, driving the usage of wearable AI devices in the region. The companies operating in the region are introducing various smart wearable devices with advanced features at affordable price points. For instance, in May 2018, Xiaomi introduced Mi Band 3 at USD 30 that had built-in sensors such as optical heart rate sensor, acceleration sensor, and pedometer. The presence of major smartwatch manufacturers, such as Samsung and Xiaomi, is also further supplementing the adoption of smart wearable devices. Europe accounted for over 25% share in the wearable AI market in 2018 due to the higher per capita income and spending patterns of consumers in the region. The large consumer electronic players operating in the region are incorporating advanced features into their product offerings to better compete with inexpensive products from foreign players entering the market. Companies with premium offerings, such as Apple and Facebook, hold a majority share in the region. The wearable AI market is led by large players such as Apple, Samsung, Fitbit, Huawei, Facebook, and Microsoft. Large enterprises are currently focusing on developing inexpensive solutions to compete with regional players from the Asia Pacific region. The tech players have collaborated with luxury brands to better compete with the high-end watch companies by developing their own premium product line of smartwatches. For instance, in September 2016, Apple partnered with Nike and Hermès to develop its own product line of premium smartwatch offerings. Startups, such as Misfit and ANTVR, are focusing on providing cost-effective product offerings to gain an edge over the large players operating in the market. 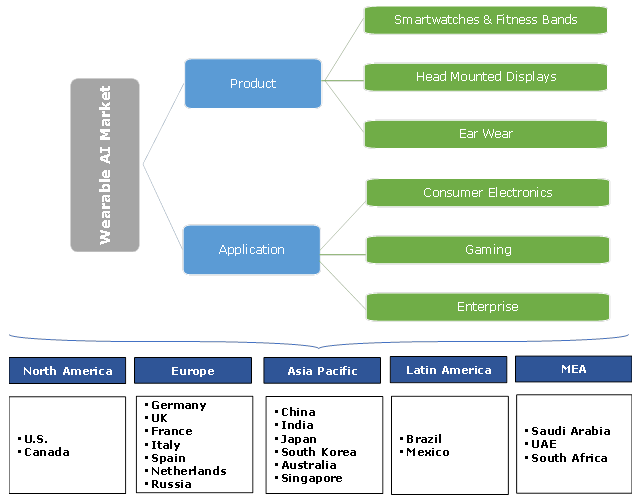 Some of the players operating in the wearable AI market are Apple, Samsung, Facebook, Fitbit, Garmin, Fossil, Xiaomi, Huawei, Microsoft, HTC, Bragi, Jabra, ANTVR, Huami, and Google. Smart wearable technology can be incorporated in electronics that can be worn on the body or as an accessory. Some of the most distinguishing features of smart wearable devices are their ability to connect to internet and communicate with other devices, enabling data transfer between devices. In the last five years, smart wearable technology has received a lot of traction due to the increasing emphasis on health & fitness among consumers across the globe. This is encouraging the smart wearable device manufacturers to develop advanced AI-based algorithms and incorporate various sensory hardware in their product offerings to allow the consumers to monitor their health vitals without any medical professional’s intervention. The changing lifestyle and shift in the spending patterns are also promoting the use of smart wearable devices.